Propane is a safe and reliable energy source and is very well suited for RV use. Propane is a very safe and reliable energy source and is very well suited for RV use. It is stored as a liquid and used in a vapour form to supply fuel to cook, heat and, in the case of an RV, to help refrigerate your food and beverages when you’re not able to use shore power. Safety is the most important factor when filling, handling or storing tanks or using the appliances. If you are new to RVing and are unsure of the proper operation procedures, then talk to someone who is familiar with their use. 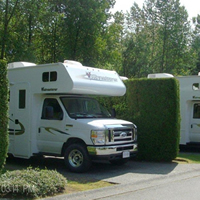 Or take your RV to your local RV service centre and hire an RV technician to discuss and demonstrate how to operate the propane system and use the appliances. Ask what to do if the smell of propane is detected. Given that propane is colourless and nearly odourless in its natural state, many lives have been spared by an odourant added during the distillation process. It is called ethyl mercapton and warns the occupants of a leak. The very noticeable rotten egg/garlic smell should lead to an immediate evacuation of the RV by all occupants and a quick shutting down of the container service valve to ensure the safety of you and your family. Leave the area until the odour clears and do not use the RV until the cause of the leak has been determined by a qualified gas fitter or RV technician. They have equipment to check for any leaks in the supply lines and also ensure that the proper operating pressure is provided to the appliances. They will use a manometer, leak test solution or an electronic leak detector to determine the problem areas. One quick note—never use a cook stove as a space heater. When using the stove always have a roof vent or window opened to remove moisture and any possible carbon monoxide gases. It is very important to purchase and install LPG and carbon monoxide detectors. If your RV is already outfitted with these units check the batteries frequently to ensure they will function properly when needed. There are two types of containers used to store LP gas in RVs. The first is an American Society of Mechanical Engineers (ASME) tank, which is primarily used for motorhomes and some van conversions. These tanks are permanently mounted to the frame and are situated in a horizontal manner with separate ports for filling, vapour and/or liquid supplies. The second type is a Department of Transport (DOT) cylinder usually found in a 20- or 30-pound capacity. They are often used on fifth wheels, travel trailers, tent trailers, pick-up campers and even your residential barbecue. These cylinders are for vapour use and can be found in horizontal or vertical configurations. You must use the cylinders in their proper operating position. Improper use may allow liquid fuel to flow to the regulator, which is designed for vapour use, and damage could occur. In the early years the most common service valve found on most DOT cylinders was the Prest-O-Lite (POL), which is a left-handed thread, bullet-nosed, brass fitting that requires a 7/8 wrench to install or remove the pigtails. Recently in the United States changes have been made in the interest of public safety. In 1995, the Quick Connect Coupling (QCC) was first developed and was found primarily on barbecue grills. A few years later they became mandatory for RV use. To further ensure consumer safety, the Overfill Protection Device (OPD) was made a requirement on all newly manufactured cylinders—since 1998—with a capacity of four to 40 pounds. The OPD, which is part of the filling valve, serves as a safety shut-off device and prevents the overfilling of propane cylinders to ensure safe use by the consumer. If you plan on travelling to the United States you will need cylinders with OPD type valves to allow the refilling of LP gas; the POL type valves are still permitted in Canada with a 10-year life cycle or requalification deadline. You can tell if you have an OPD valve by the triangular valve hand wheel, external threads and the OPD designation on the hand wheel itself. They are also distinguished by the fact that propane will not be released by simply opening the valve without the pigtail attached. There are two types of pigtail fittings. One is black and is designed for barbecues up to 50,000 BTUs, while the green pigtails are designed to accept up to 200,000 BTUs. Another difference between the two is the sensitivity of the excess flow device, which is made to close when the vapour flowing through it exceeds the prescribed flow rate. In the next article we will be discussing the RV propane regulator and piping to the interior of your RV. Make sure your unit is in tip-top shape before you head out camping this season.